Bad Career Choices or Forced Career Choices? – Are bad placement policies to blame? In many top schools in India including some old IIMs, poor placement policies are ruining careers and also the reputation of business schools. For the last week or so, we have received innumerable mails on our helpline Eklavya. None of them say anything new. It is something we are aware of and have spoken of in various articles before (Read this). We will highlight some poorly designed placement policies that are a cause of much heartburn among many graduates. There is a collectivist mindset at work that stifles individual choice. However, some of the policies are so irrational that people with short term goals in mind are ignoring the permanent long term damage it is causing. This is the single biggest factor leading to forced career choices which are hurting everyone involved in the eco-system. Companies, Business Schools and the individual student. It is a known fact that placement committees lie to many companies. This is a feedback we have received from many recruiters and alumni from various schools associated with insideiim.com have repeatedly cited examples of such cases when they were students. All companies want access to the best talent and hence want to show up first on campus. Students try to game the system by lying to recruiters about schedule of the placement season. Recruiters try to game the system by arm twisting campuses who have great talent but have little bargaining capacity. The student really has no choice to sit back, think or explore his or her options. There is very little information available about many companies and the kind of roles on offer. The big batch size leads to unimaginable insecurity and out of desperation students end up applying to whichever companies turn up first so that a job is ‘secured’. For e.g. we received an email from a student in one of the top schools who says he wants to wait for companies and profiles of his interest but they may not be slotted by the placement committee. The high paying middle office and support roles will turn up first but that isn’t what he wants to do. He wants to be on the client side and is willing to make a little less money. In any case, this is a summer internship so there isn’t so much at stake in terms of money. However, he is insecure about waiting because what if he doesn’t make the cut in profiles of his choice which turn up later? He also says that the placement committee and the placement chair decide the schedule on their own whims. Students have no say or choice in which company comes first. Career decisions made out of insecurity can seldom turn out right. Students end up taking up roles they don’t like. Employers are stuck with new joinees or interns who may have very low motivation levels at work. Business schools suffer in the long run in terms of reputation as low motivated graduates will ensure the school’s brand is tarnished repeatedly whether it is a summer internship or a full-time job. It is a classic case of wrong person in the wrong job. And the cycle keeps repeating year after year. One of the ways business schools may have inadvertently solved this problem is by admitting more freshers who have no clue what they want to do so early in their MBA 🙂 Picture this – First year students enter the business school in June last week/July first week. In some schools summer internship process starts in the last week of August! 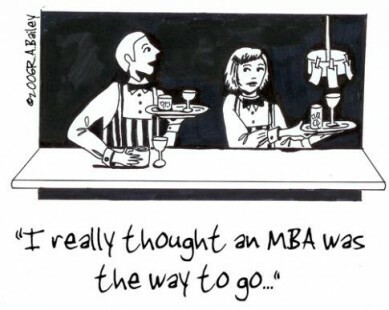 Indeed, in many cases business schools are just glorified placement agencies. And some of them are quite incompetent at it. To add salt to the wounds, the economy isn’t exactly helping. 100% placement obsession means you have bad PPO policies. In some schools, you have the option (thankfully!) of rejecting it if you believe you can crack a ‘higher ranked’ company during finals. Internal rankings are a subject of much debate on campuses where there is some respect of job seeker’s preferences. On most campuses, you are kicked out of the process as soon as you get a PPO. There is no question of ‘acceptance’ or ‘rejection’. Now, it is entirely possible that although one did very well during the summer internship, that isn’t the career one wishes to pursue in the long term. The company may be impressed by your performance and may offer you a full-time role. The business school forces you to accept that offer. You have no choice. Accept it or find a job on your own. So students have learnt to game the system. Even if there is a 10% doubt in their mind that they do no want to pursue a career or work in a particular company, they will ensure they do not get a PPO. The best way to do that is to NOT work properly during the internship. Do not give your best. Result – Company professionals blacklist the business school for sending poor quality graduates. The business school not only has to bear the reputation damage but also has to place the graduate during the final placement. Double whammy! Many graduates stuck with a PPO in a company or sector they do not wish to be in end up job hunting within the first 15 days of them starting their work. Here is a stat you can chew on – Of all the job applications we have got in our various talent hunts that we do for our clients on InsideIIM.com, over 80% of them are from graduates who have graduated in 2013. It clearly shows massive job dissatisfaction and complete expectation mismanagement. Yes. The class of 2013 is still looking for jobs. The system is broken and it is a mess. Some serious work needs to be done to fix this rot. Until then, everyone will continue to lose in the long run. Now, get 1st Year MBA courses at Wharton for Free – Boon for Indian MBA students?